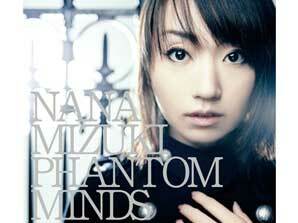 A CD by seiyu Mizuki Nana. 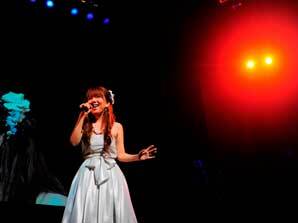 Makino Yui performing at Anime Song Live. CDs by seiyu, the actors who provide the voices for characters in anime and video games, routinely appear on Japan's music charts. In addition to stepping into their on-screen roles to sing theme songs and other musical numbers, it is not uncommon for Japanese voice actors to perform as artists in their own right. As seiyu achieve new levels of popularity, more and more people are aspiring to careers in voice acting and trying their hand at dubbing using karaoke-like facilities. Branching OutMizuki Nana is one of Japan's leading seiyu. Since making her voice-acting debut in 1998, she has lent her talents to a range of characters in anime popular with overseas audiences, including Naruto's Hyuga Hinata and Aihara Kotoko of Itazura na Kiss (Playful Kiss). 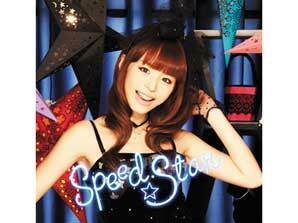 As the number of albums featuring songs performed by Mizuki "in character" increased, her own popularity as a singer began to grow. In December 2000 she used her exceptional singing talent to debut her very own single. In June 2009, her seventh album soared to the top of Japan's Oricon weekly music chart, the first ever number-one album by a voice actor. That same year she appeared on NHK television's Kohaku Uta Gassen (Red-and-White Song Festival), a hugely popular music show broadcast live every New Year's Eve, which achieved ratings of over 40% in 2009. This propelled her into the ranks of the country's most recognized musical talents. Makino Yui, another Japanese voice actress, appeared in the event Anime Song Live organized by the Ministry of Economy, Trade, and Industry and the Foundation for Promotion of Music Industry and Culture. Makino was already an accomplished pianist and singer before making her seiyu debut as Sakura, the heroine in the anime series Tsubasa: Reservoir Chronicles. Makino has also achieved fame among overseas audiences, and has been invited to participate in numerous events outside Japan, including a Japan-China cultural exchange event in 2007, where she represented Japan; Japan Expo 2009, held in Paris in July 2009; and the New York Anime Festival, which took place in September 2009. A CD by seiyu Hirano Aya. A cafe where patrons can try the Afrec! service. Hirano Aya, meanwhile, gained an immediate following for her voicing of the title character in Suzumiya Haruhi no Yuutsu (The Melancholy of Suzumiya Haruhi). The actress's photogenic appearance helped launch her career as a "seiyu idol" whose photographed image graces the pages of various magazines. Hirano is so popular that a collection of photographs of her has now been published. Some male seiyu have also achieved a strong following. The likes of radio personalities Ono Daisuke and Kamiya Hiroshi have received kudos among fans and critics alike, as has Miyano Mamoru, who is also a successful actor and singer. 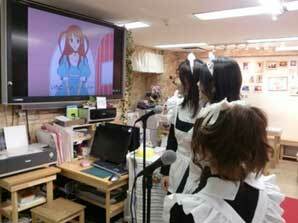 Voicing Their AspirationsA growing number of people in Japan are setting their sights on careers as voice actors. The High School Animation Fair is a festival for high school students who dream of one day working in the animation industry. Participants can submit their work for judging in four different anime-related categories. The number of applicants for the voice-acting division is increasing, attesting to the growing level of interest in the field. One way would-be seiyu can prep for the future is with the popular Afrec! service. (The word afrec, a shortened version of the English "after recording," is the Japanese industry term for dubbing sessions). This service, which is available at karaoke parlors, gives participants the chance to dub the voices of their favorite anime characters in step with on-screen images. Characters' lines appear on the monitor, and participants can have their performance scored based on the timing of their delivery. Budding voice actors can have a go at dubbing well-known scenes and dialogue from popular anime TV series and movies including Mobile Suit Gundam and Haha o Tazunete San-zen Ri (3,000 Leagues in Search of Mother). Dialogues for two actors are also available, so participants can either work out who's playing whom with a friend or take on both parts at once. Like karaoke, which allows people to impersonate their favorite singers, Afrec! lets fans step into their favorite roles from the world of anime and movies.